More than 50 years separate the publication of Chimamanda Ngozi Adichie’s novel Americanah from the book considered the prototype for the modern African novel in English, Chinua Achebe’s Things Fall Apart. Understandably the passage of time means the image they present of the Nigerian experience is vastly different. Achebe’s Nigeria is a tribal land held together by a shared set of beliefs and customs, a clearly defined hierarchy and the rhythm of the seasons. It has its own religion and government, its own system of money and judicial mechanism. ThIs is the stability fractured by external forces in the form of British colonial settlers and Christian missionaries who seek to impose their own way of life on the Igbos community. Achebe tells the story through the experience of Okonkwo, a leader of this community. He is a ‘strong man’ or warrior, renowned for his prowess as a wrestler with a well established coterie of wives and children and several yam fields. All this begins to fall apart when he accidentally shoots dead the son of the village’s oldest residents and one of the most important of its elders. Okonkwo is exiled for seven years to appease the gods he has offended. During his absence white settlers move into his community, intent on introducing their religion. As the number of converts increases their foothold strengthens and a new regime is introduced that does not tolerate the ancestral spirits and deities that have sustained the villagers all their lives. Desperate to regain what they believe is rightfully theirs, they destroy the symbol of the alien invaders, their Christian church. But retribution by the new authorities is swift and many of the leaders are imprisoned where they are humiliated and insulted. Okonkwo, incensed by what he finds on his return from exile, exhorts his fellow clan members to wage war against the white man. Too late he realises that he does not have their support. The warrior is brought down in the unequal battle between the individual and society. In Adichie’s Americana, the educated middle class young people can’t wait to get away from the country and its stultifying atmosphere. Their Nigeria is a land ruled by a military dictatorship. Its young and intelligent citizens are denied an outlet for their energies because the authorities are afraid they will become radicalised at university. People like Ifemelu and her boyfriend Obinze plan to leave the country not solely because of the unrest but because they want to escape “the oppressive lethargy of choicelessness” and replace it with “choice and certainty.” and a brighter future in America. But their plans fall apart when Obinze fails to get a visa and Ifemelu has to make the journey alone. He ends up as an illegal immigrant working in London delivering washing machines and cleaning toilets, while she has her eyes opened to an aspect of life that had completed escaped her notice back in Nigeria: race. Ifemulu triumphs because she refuses to be anything other than authentic. The moment she stops hiding her Nigerian accent beneath an American one and refuses to straighten her hair she feels truly free and true to her roots. But when she finally returns home and is re-united with Obinze in the newly democratic Nigeria, it is to feel a stranger in her homeland. The country has moved on, emulating the West in its adoption of mobile phones, skimpy clothes and fast food (Ifemelu is horrified to find that frozen imported chips are seen as far superior to ones made from real potatoes grown locally). Sometimes it becomes more harsh and overt. And at last the locusts did descend. They settled on every tree and on every blade of grass; they settled on the roofs and covered th bare ground. Mighty tree branches broke away under them, and the whole country became the brown-earth colour of the vast, hungry swarm. Adichie is even more withering when it comes to exposing the hypocrisy of her own people, a country that has no patience for the Americanahs (those who return from overseas full of barbs about their countrymen) and yet endorse foreign values and practices, people who as one parent points out don’t think something is real unless it comes from abroad. Posted on March 24, 2015, in African authors, Book Reviews, Nigerian authors, world literature and tagged Chimamanda Ngozi Adichie, Chinua Achebe. Bookmark the permalink. 13 Comments. I did like a part where she wrote about her hair, though. That seems rather trivial for me to bring up, but I have very curly hair from my Italian heritage, and while I love it, I could sympathize with her trying to tame it. 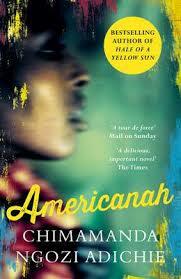 I began liking Americanah, but ended up feeling very pissed off. Very. It seems more of the blame game to me: my problems are because others treat me badly because I’m Black. I feel rather shocked writing it here, but that’s what I felt she was saying deep down. I am considering these two books for my Book Riot Read Harder challenge for ‘a book by an author from Africa’. Still thinking what to read first. Hehe! I love how how wrote about these books together. I haven’t read either of these, but have had Americanah on my list since it came out. Now, I’m tempted to read them together. The subtle criticisms in Americanah are so interesting – it sounds like it provides a lot of food for thought. Such a thoughtful, in-depth post. I have Achebe on my shelf, and never considered ‘Americanah’. But after this post I look forward eagerly to reading ‘Things Fall Apart’, and ‘Americanah’ will be going on my wish list. Excellent piece, never read Things fall apart but think I might be interested in it now -you make it sound very good indeed. I too thought Americanah was fabulous, I can see how interesting it would it to read it after Things fall apart. I read Americanah last year but couldn’t decide what I wanted to write about because there was just so much to say. 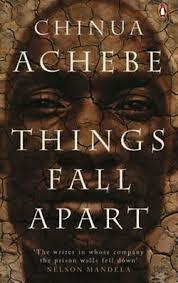 Reading Things Fall Apart made me reflect again and it actually went back and reread some sections.